The offer is only valid for refurbished 4G VoLTE smartphones purchased from Quikr Bazaar that are listed under the Certified Mobile category or devices that are a part of the Quikr Assured program. Customers then have to activate a Jio SIM on it and opt for any of the two recharge plans eligible for the cashback. Buyers can either get a new Jio mobile connection or use their existing Jio SIM card on the device to avail the cashback. Once the buyer has activated a Jio SIM on their smartphone purchased from Quikr Bazaar, they can choose from the Rs. 198 or the Rs. 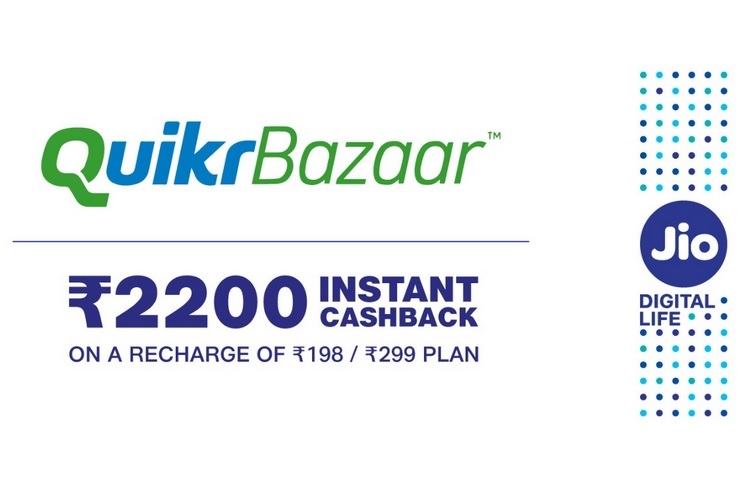 299 prepaid plan to avail the cashback. The Rs. 198 plan offers benefits such as unlimited calling and 2GB of 4G data per day with a validity of 28 days, while the Rs. 299 plan allows unlimited calling and offers 3GB of daily data for 28 days. How the Cashback Will Be Credited? Once the customer has opted for either of the two Jio prepaid plans, they will get a cashback of Rs. 2,200 that will be credited to their account through the MyJio app. The Jio-Quikr cashback offer is only valid for devices purchased between November 29th and February 25th. As for the eligible devices, you can choose from a wide range of refurbished smartphones from brands like Samsung, Xiaomi, Apple and Nokia among others from Quikr Bazaar. You can check out the complete list of eligible smartphones for the Jio-Quikr cashback offer here as well as on the Quikr app.